Attending the studio opening back in November, it was immediately clear how important and influential the studio space is to Carlos Silva. An explosion of colour and geometry, everything has its place and its structure; a clear sign of an architectural mind. Carlos is gracious and kind and its a pleasure to talk to him about his painting techniques and his life in Berlin and, in particular, Milchof studios where his beautiful, bright studio is. A passionate talker and excited to reflect on his own painting methods, Carlos is engaging and fun and I couldn’t wait to set up a real interview with him. 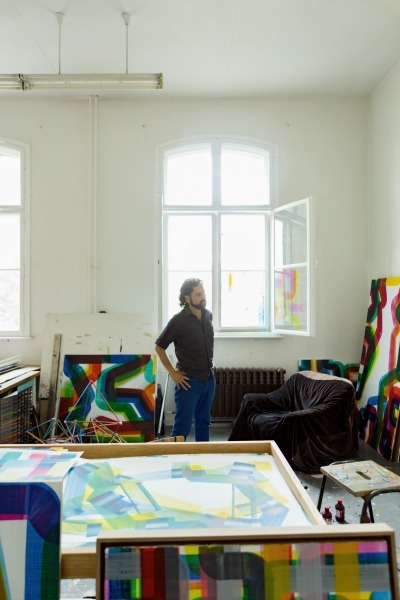 After a few busy months of projects on his side and events and exhibitions on ours, we finally caught up with Carlos to interview him about how his art and architecture merge, his painting and his key inspirations and what, for him, Berlin offers on an artistic level. You’re from Colombia and you’ve been in Berlin for many years now. The vibrancy and colourful potency is very prominent in your art, do you feel there’s somewhat of a Latin influence in your work? I don’t think that the way I use colour has got to do with my background. In fact I’ve been living in Berlin for more than 17 years and I started using primary colours only a few years ago. Before that I worked with charcoal and black to create the images I wanted to make. At some point black insulating tape became the only tool I used to paint and draw. So my work hadn’t been that colourful at all. However I understand the association with Latin America when you see the type of work I’m producing now. Your paintings toy with the fusion of architectural influence and calligraphy. Can you tell us a little more about this and the motives behind your work? As you know i’m trained as an Architect, and probably this is the biggest influence, visually, in my work. When I’m creating an image, geometry and classical proportions play a major role in the composition. The paintings come to life by applying the colour with precise brushstrokes and lines drawn by pencil. I think the brushstrokes have many calligraphic aspects such as the fluidity of the line, combined with the accuracy and precision, which creates a tension between control and chance, based on the attributes of the brush which gives me a certain path to follow on the surface to create space on the picture. In fact, it has been really inspiring to look at Chinese calligraphy and its philosophy to reinforce certain ideas I have been looking for. But this is a field of action that I’m still researching and hope to keep on discovering new aspects which will give my work the twist that I’m always looking for: change and renewal. Your studio is at the renowned Milchof Studios in Prenzlauer Berg where you’ve been for the majority of your time in Berlin. How has the city developed and evolved around you and your studio, artistically speaking? I have been working at the Milchof studio for more than 16 years now and things have changed a lot in that time. We were in the old location until 2004, but the place has since been demolished. It was an old dairy factory with a huge courtyard. Our studios were big and extremely cheap to rent and quite inspiring for any budding artist, but the building itself was falling apart. In 2004 the local Bezirk offered us this former school, where we are working now. In fact, my studio is a former classroom. I count myself very fortunate to be working in this fantastic environment. Tell us a story about one of your most memorable artworks? I would recall a piece from 2012 that propelled my work in a very positive way and it was the work that brought me to use ink on paper on a big format. The work is called CMY-No-K # 16, ink on paper, 210 cm x 80 cm. (see web site ) This is quite a simple piece with vertical blue and yellow lines, which are crossed and linked by magenta diagonals made with a very thick brush. This work has many qualities that I really love; the simplicity in the use of primary colours, its geometry and the impact it entails once you are in front of it. This image gave me the clue to see what I was doing and lifted my work onto a different level in terms of colour and composition. What object in your studio most defines you as an artist? It’s a difficult question, but I think the wooden table that that I’ve been working on for years would be the best example. Its surface has unconsciously captured the essence of my work, layering colours, materials and time. The table can be seen as a piece of work in its own right. Book A Studio Visit Now! What, for you, makes Berlin such a creative capital and what does Berlin provide you with regards to artistic inspiration? As I already indicated it is important for a capital such as Berlin to provide the space for artists to work and develop. There is more and more pressure on artists to find and afford those spaces. Without that you cannot do your work. Where is your favourite local spot when you take a break from the studio? Sometimes I go for a walk in and around the Mauerpark to clear my brain and catch a bit of fresh air. What exciting projects have you got coming up that we can look out for? I am working on a project with the “Museum gegenstandsfreier Kunst” (museum of abstract art) near Hamburg where there will be an exhibition and I will create a floor design for the entrance area outside the building. And finally, in one word – My studio is my… what? 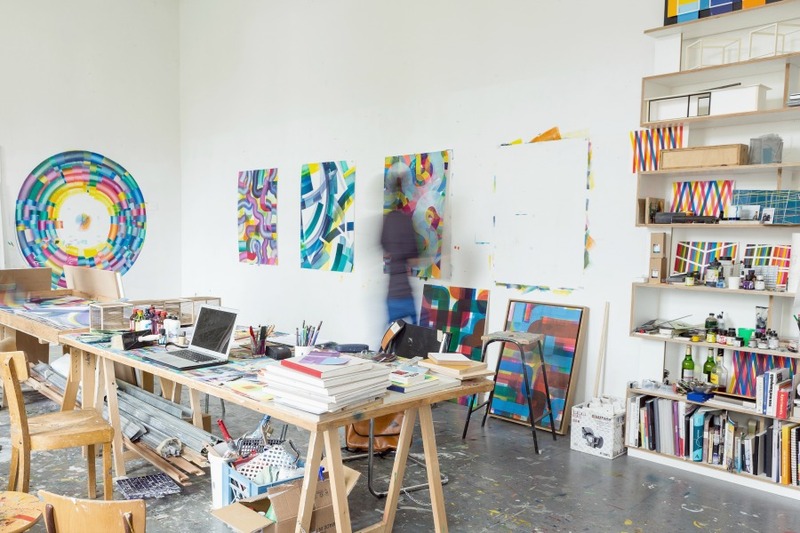 A contemporary art platform for studio visits, showing a curated selection of artworks online and in the artist studios.